Perinatal mental health problems carry a total economic and social long-term cost to society of about £8.1 billion for each one-year cohort of births in the UK, according to a new report ‘The costs of perinatal mental health problems’ released today by the London School of Economics and Centre for Mental Health. However the report also finds that the NHS would need to spend just £337 million a year to bring perinatal mental health care up to the level recommended in national guidance. The report is part of the Maternal Mental Health Alliance’s ‘Everyone’s Business’ campaign (www.everyonesbusiness.org.uk), which calls on national Government and local health commissioners to ensure that all women throughout the UK who experience perinatal mental health problems, receive the care they and their families need, wherever and whenever they need it. Launching officially in Parliament on Tuesday 21st October, the report finds that the costs of mental health problems among women in pregnancy are far greater than previously thought; the cost to the public sector of perinatal mental health problems is five times greater than the cost of providing the services that are needed throughout the United Kingdom. 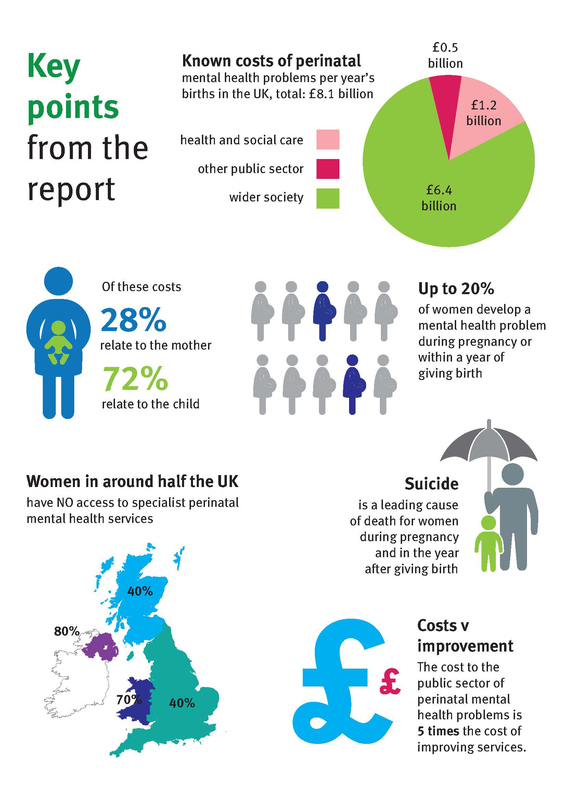 Perinatal depression, anxiety and psychosis together carry a total long-term cost to society of about £8.1 billion for each one-year cohort of births in the UK. Nearly three-quarters (72%) of this cost relates to adverse impacts on the child rather than the mother. Over a fifth of total costs (£1.7 billion) are borne by the public sector, with the bulk of these falling on the NHS and social services (£1.2 billion). Other costs include loss of earnings/impact on someone’s ability to work and quality of life affects. About half of all cases of perinatal depression and anxiety go undetected and many of those which are detected fail to receive evidence-based forms of treatment. Specialist perinatal mental health services are needed for women with complex or severe conditions, but less than 15% of localities provide these at the full level recommended in national guidance and more than 40% provide no service at all. Click here to view the outcome of a recent mapping exercise to assess the levels of specialist community and inpatient perinatal mental health services across the UK from the #everyonesbusiness campaign.